We posted this graphic on Facebook this week. Here, we will expound on it. On average, we received $4,000/month in 2015, and we spent $4,200. This is $50,400 for a year to pay 2 people, run an organization in the US and a partner organization in Kenya, and sponsor 30 children and young adults in school (some of them in boarding schools, some of them in Transition Home sponsored rented rooms who also received an allowance to buy food and necessities). 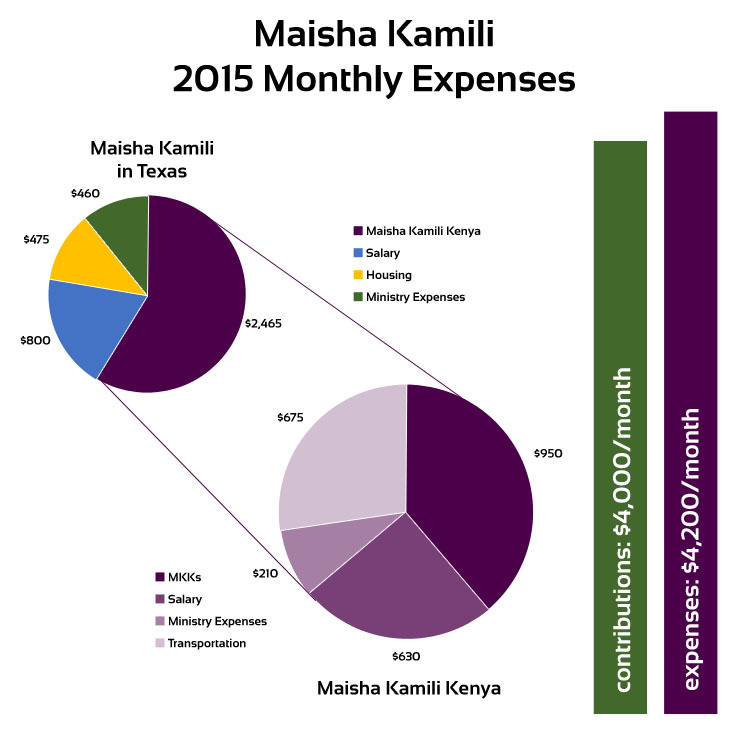 Housing and Salary under "Maisha Kamili in Texas" was for the Kahindi family. Salary under "Maisha Kamili Kenya" was for the employee in Kenya (Lyz). Ministry expenses include, on the US side: software to manage our financial records, fees for international wire transfers, printing expenses; on the Kenya side: office supplies, board members' retreat, a new laptop ($580), phones for 3 people (Rodgers, Rachel, and Lyz), internet. Transportation expenses may look disproportionately large. One reason is gas. We fill up our SUV an average of 9 times per month, $35-$40 each time (we fill up way before we are close to empty). Because of the state of the roads (pot holes and bumps), we have to replace various parts of the suspension on our car every 3 or 4 months. Our side mirrors were stolen twice. They cost $150 each. We also had to replace the transmission ($940). Plus car insurance, oil changes, and various other repairs. This country, these roads, and driving off road are not easy on a car. This category also includes public transportation, which we use sometimes, around $50-60 per month. In 2016 we have to buy new tires.